Thousands of visitors, tourists with families, generations clam diggers and sun seekers descend on Ocean Shores this past weekend for the expanded Ocean Shores Razor Clam and Seafood Festival. 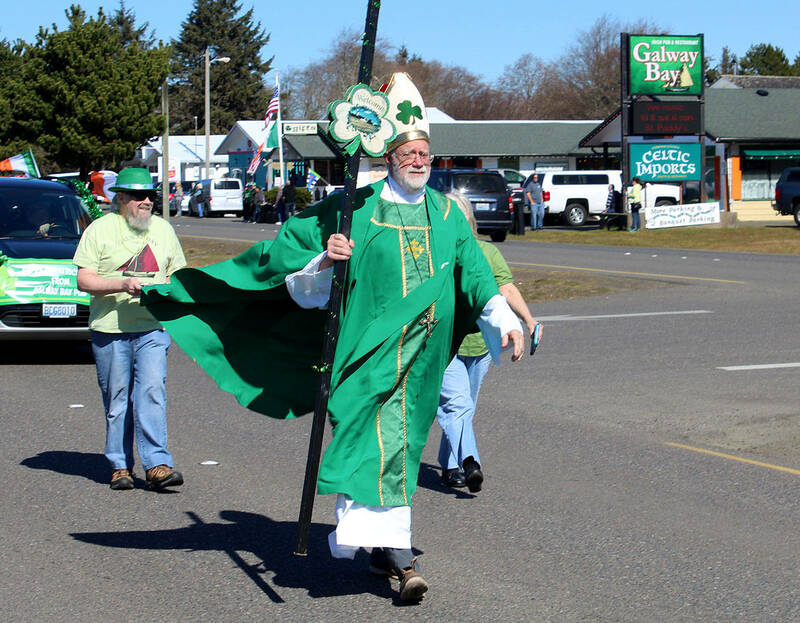 On Saturday, there was a virtual parade of cars from Hoquiam to the gates of the city, and on Sunday there was a literal parade too — the annual St. Patrick’s Day Parade led by Galway Bay’s Liam Gibbons and the Grays Harbor Irish Heritage Club. Ron Lambert of Bennett’s Fish Shack reported his business was booming all weekend with estimated record crowds at the Ocean Shores Convention Center on Saturday for the Clam Festival. At the festival, all 1,000 $5 passports to sample the five chowders were sold out, and many of the vendors reported their best sales for such an event. “We have some brand new vendors and they have been overwhelmed with the quality of the event,”said Lambert, who was the master of ceremonies, announcing the various festivities on Sunday. The emphasis on seafood seemed to please all tastes, and a total of 136 dozen oysters were served up over the two days of the festival, with about an even split of those that were served up raw and those that were barbecued. Oysters were local and came from Brady’s Oysters, Lytle’s Seafood and Taylor Shellfish. Organizer/Producer for the Ocean Shores Chamber of Commerce event Scott Nagel noted the band that played the Saturday night party at the Convention Center — 80 Proof Ale — proved to be “so awesome that we booked them for the Sand & Sawdust Festival party on June 29. “You could feel the energy in the air – positive, enthusiastic and people having a great time. The Chamber has a multi-year plan for this Festival and it felt like year 2 in year 1,” Nagel said. Some of the fun new features this year included a clam contest for the biggest and smallest razor clam brought in during the dig on Saturday. “The clam contest was a big hit. We had about 50 entries, which we thought was good for the first time, and expect hundreds next year,” Nagel said. The prizes, a “large” and “small” chainsaw carving, by local artist Tony Robinson from Copalis Crossing. Galway Bay’s Liam Gibbons leads the annual St. Patrick’s Day Parade past his establishment on Pt. Brown Ave. in Ocean Shores on Sunday. Quinton Chastain prepares the oysters. He is from the South Puget Sound Community College and has been working with Clam Festival producer Scott Nagel on the annual Dungeness Crab Festival for the past 10 years. Quinton Chastain prepares the oysters. He is from the South Puget Sound Community College and has been working with Clam Festival producer Scott Nagel on the annual Dungeness Crab Festival for the past 10 years. Patrons line up for chowder from the Ocean Crest Resort in Moclips. An outdoor dining area proved to be a popular feature, with a covered tent and choices of several vendors surrounding it. Juatin the Circler provided decorative artwork outside the Ocean Shores Convention Center. Joy Donohue from Spanaway made a sign to go with her Amateur Clam Chowder Cookoff entry. Measuring clam to find the biggest and smallest harvested Saturday were officials from the Washington Dept. of Fish & Wildlife. Travis Haring and Steve Sweet measure clams brought in by Kathy Poole of Ocean Shores. QBRC chef Abe Perez is congratulated for winning the Professional Clam Chowder Cookoff by Ocean Shores/North Beach Chamber of Commerce Executive Director Piper Leslie.